The past twelve months seem to have passed quickly as I sit here looking back over them. I’ve been places both real and figurative, seen amazing sights and met some lovely people. There have been highs I could scarcely have dreamed of, and lows I would rather not dwell on. In January I travelled to Sweden for the first time to visit my daughter who had moved there the previous summer. We had a lovely time hanging out together and I got to indulge my tea habit. Leaving her to return home again was a bit of a wrench, but then later in January I went to my first spider show (SEAS–South East Arachnid Show) with dear friends Gemma and Dom. I didn’t indulge myself but did help a certain person acquire four tarantulas. Fast forward to March and, wearing my Autistic Inclusive Meets director hat, a trip to Parliament with Emma for the launch of the Westminster Commission on Autism’s report into harmful fake autism cures. As you can see we were completely in awe of our surroundings and took it all very seriously. May brought a visit to the British Tarantula Society’s annual show in Warwickshire and the acquisition of my first tarantula. Not bad for a woman who used to be afraid to get into bed if she saw a spider on the bedroom wall or ceiling. By the end of June I was counting down days, eagerly anticipating my upcoming visit to Canada and the opportunity to meet and hang out with my beloved friend Patricia in person. We had an amazing time over the two weeks I was there, getting to travel across the Maritime provinces, visit some wonderful places and meet lovely fellow-neurodivergent people. I completely fell in love with Canada. It almost broke my heart to leave and come back home: how I cried. But I’d not even been back two days when my daughter arrived from Sweden for a visit with her boyfriend. It was fantastic seeing her again and we got to do some fun things together including visits to Stonehenge and the Natural History Museum. Unfortunately, after her visit burnout hit me hard along with PTSD from the relationship I talked about in my previous post: I ended up being off work for the best part of two months before starting to recover towards the end of the year. It was a difficult time with several episodes of self-harm. I’d been having something of a midlife crisis in the midst of my mental illness, and realised that I needed to make space in my life for artistic expression. I bought myself a copy of Neil Gaiman’s Art Matters, illustrated by Chris Riddell, and found it truly inspiring. It didn’t hurt one bit to get these encouraging words from Neil himself either. Feeling inspired, I got an additional boost when invited to be part of the launch event for close friend Jon Adams’ charity, Flow Observatorium. I was also deeply honoured when Sonia asked if I would read a message from her since she wouldn’t be able to attend. That month, September, also saw me turn forty five and was a turning point in my mental illness as I began to recover. October saw me teaming up with Gemma to welcome the newest regeneration of our favourite Time Lord: we were both agreed that we loved the Thirteenth Doctor as portrayed by Jodie Whittaker. Less than a week later and I was meeting another lovely friend, Naomi, in a field down in Sussex for the re-enactment of the Battle of Hastings at Battle Abbey. Great day out that would be hard to top. Having said that, November excelled itself as I went to the O2 Arena to see Florence + The Machine live in concert. Wow! Utterly breathtaking, and an experience I won’t forget in a hurry. The atmosphere was so positive that I was buzzing for days. Rounding off the month, I got to visit Tate Modern and experience some exceptional works of modern art, including some de Stijl paintings by van Doesburg and Mondrian, a whole room of Mark Rothko, and so much more. That day was completed wonderfully with a meal in the company of Emma and Amy, fellow directors of AIM. Into December now, as a couple of weeks later I was back up in London for a meeting with a PhD research student from France, following which I bumped into dear friend Jon. We had a good chat before I left to explore the National Gallery, just off Trafalgar Square. It’s no exaggeration to say I was in heaven! Over the course of nearly four hours I wandered the galleries, lost in a kind of rapture. It’s hard to single out individual works, but the four van Gogh paintings on display were beyond comparison! I stood in front of each of them, examining the brushwork, feeling the emotion laid onto the canvas along with the oil paint. And so at last, with no little conceit, I finish up my review of the year by placing a painting of my own alongside the genius of Vincent. Not for comparison, not for any other reason than this: 2018 was the year I finally felt comfortable calling myself an artist. And that makes it a good year. I went out for lunch yesterday. 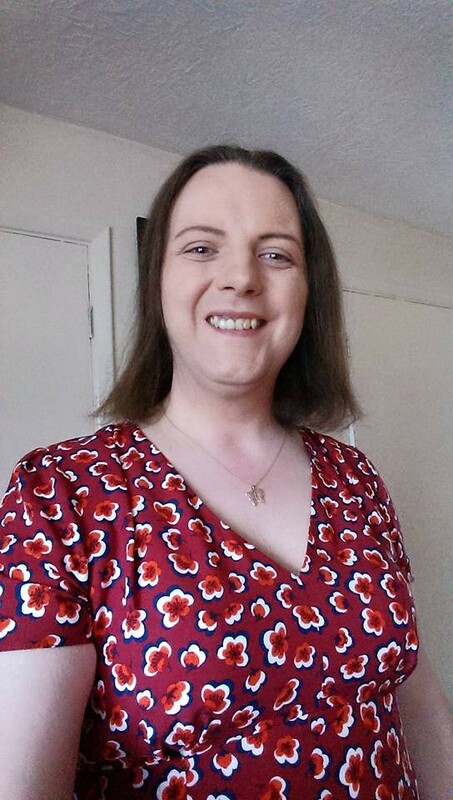 It struck me later that this was the first time I’d eaten out since before I began my transition, more than 18 months ago. But that didn’t even occur to me until hours afterwards: I was far too preoccupied. You see, I was meeting a young lady. I wanted to make a good impression. It was a lovely, sunny day so I wore this new red dress (rather daring for me because it barely comes down to my knees) with a pair of red heels and spent nearly 30 minutes doing my face and hair. Excitement wrestled with nervousness as I drove into town. I felt good; I felt confident as I walked from the car to the restaurant. It was five minutes of twelve: I was a little early which suited me. I would have time to get settled and make myself comfortable. It was early for lunch so the place wasn’t too busy and I could choose where to sit: I decided on a small two-seat table by the window where I would be able to watch for her arrival. A waiter brought a menu; I explained I was waiting to meet someone and just ordered a sparkling water. I browsed Facebook to pass the time while keeping one eye on the passers-by. Nervousness crept in: what if she was late? What if she didn’t come at all? Would we get along face to face? We’d only chatted online before this. I needn’t have worried. She arrived just a few minutes later and saw me through the window. She smiled and gave me a little wave; I reciprocated. She joined me at my table, ordered a water–still to my sparkling–and we started to talk. Somewhere during this we ordered food and ate but the meal was definitely a sideshow to the main event. Not that we didn’t enjoy it, it’s just that we were deep in conversation. Quite something for two people who are usually uncomfortable in social situations. It was over too soon. She had to head off to work shortly before three, so after paying the bill we walked back to our cars. We hugged before parting and it felt wonderful. We will meet again. I’m still working through my memories of yesterday: such a wealth of images, impressions and emotions. The pleasure of building a relationship with my daughter after so many years, the many ways in which she reminds me so much of myself. It’s difficult for me to connect the young woman I met with my memories of her as a baby and infant. More than anything I feel so happy and grateful that she contacted me and that we are becoming friends. I feel a bond that I did not expect, a reawakening of the feelings that had languished, forgotten, in the dusty attic of my mind. I’ve missed so much of her life that I’m not sure I deserve to be invited back in with such welcoming acceptance. She is open, honest, caring and intelligent, and I am so proud to have her as my daughter. Attention to detail is a great strength of mine but also a weakness: so often I fail to see the forest for the trees. This is not unusual for autistic people.